SOLAR LS offers a line of spectroscopic multi-channel detectors for monochromators and spectrographs and PMT with USB interface for monochromators. Solar Laser Systems offers a line of spectroscopic multi-channel detectors for monochromators and spectrographs (listed in the tables below or other upon the prior agreement with the manufacturer). Detectors providing data transfer via Full-Speed USB interface (up to 12 Mbit/sec) are powered via the USB port from a PC. Powering of cooled detectors is provided from an external power supply. Power consumption is <6W for non-cooled detectors and <25W for cooled detectors. The thermostabilization system with a built-in Peltier-cooler ensures crystal temperature precision of ±0.1ºC. Solar Laser Systems offers to equip monochromators and spectrographs with new generation photomultipliers series H11890 manufactured by Hamamatsu. H11890 is a photon counter, in a single metal case containing a photomultiplier, a high-voltage power supply, a voltage divider circuit, a photon counting circuit and a USB interface. The photon counter is fully compatible with the software of spectrographs and monochromators produced by SOLAR Laser Systems. 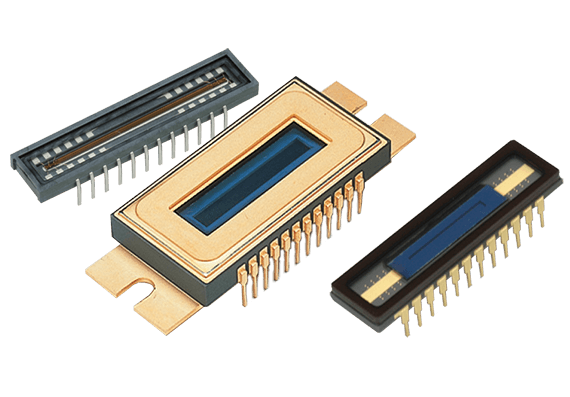 The H11890 series is available in 3 versions with three different photomultipliers, which makes it possible to use the detector for a variety of applications. The photon counting scheme is characterized by high linearity of counting and low noise. (2) Anti-blooming: the ability to prevent the spilling of excess photocharges from a saturated photoelement to neighboring elements. (3) Max exposure time is a time for which dark signal reaches 25% of the dynamic range. (1) Total number of pixels with dark current. sensitivity nonlinearity and readout noise exceeding maximum value. The first and last pixels are not counted. (3) Anti-blooming: the ability to prevent the spilling of excess photocharges from a saturated photoelement to neighboring elements. (1) Signal level is 50% of saturation. Exposure time is 10ms. DU 401A-BV model, back-illuminated CCD sensor, UltraVacTM thermo-electric cooling down to -100°C, spectral range 200-1100nm, 1024x127pixels, pixel size 26×26µm, image area 26.6mm x 3.6mm, 16 bits digitization. Newton Series, EMCCD DU970P-FI model (*), front-illuminated EMCCD sensor, UltraVacTM thermo-electric cooling down to -100°C, spectral range 400-1000nm, 1600x200pixels, pixel size 16×16µm, dual output amplifier, crop mode, Variable readout speed up to 3MHz, 16 bits digitization. iStar Series, Gated iCCD DH320T-25U-03 model (*), Ultra Fast Gated Intensified CCD Camera, spectral range 200-900nm, 124×256 CCD 100% Fill Factor, 25mm tube, Gen2 Multialkali S20 Photocathode, P43 phosphor Multi-Mhz Readout Speeds, Integrated Digital Delay Generator, 3 ns Crop Mode sensor, Photocathode dry gas purge port, USB data interface. (*) other models are supplied upon request.